Legend is not your typical linear lightbar and is engineered with the latest lighting technology. This low-profile lightbar is fully populated with powerful LEDs and combined with the Solaris® LED reflector technology to provide 360-degrees of coverage and excellent off-axis light output. Legend uses the patented ROC (Reliable Onboard Circuitry™) technology for solid state construction. ROC eliminates 85% of potential failure points found in a typical lightbar. This rugged design is engineered to reduce repair costs and increase the hours your emergency vehicle stays on the road. 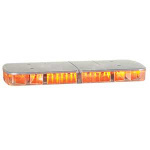 This LED lightbar is fully-featured with adjustable alley and takedown lights, front and rear lights cut-off and a dimming feature to reduce light output while the vehicle is stationary. With Federal Signal's patented HotFoot™, the Legend offers additional LED light modules mounted in the foot of the lightbar.